I am utterly astonished and delighted to learn today that I have been awarded a 2008 Cliopatria Award for Best Series of Posts. It is a rare honor to be in the company of some of the finest history writers in the blogosphere. Best Series of Posts: Tim Abbott on Trumbull's The Death of General Montgomery, Jan. 12, Jan. 13 , Jan. 14 , Jan. 17 , Jan. 18 . The examination of Jonathan Trumbull's famous painting The Death of General Montgomery in Attack on Quebec, December 31 1775 over five posts at Tim Abbott's Walking the Berkshires is good scholarly writing and engaging analysis. Abbott raises intriguing questions about historical memory, as he guides his readers through the examination of historical records. History News Network's Cliopatria Awards are the premiere recognition of excellence in history blogging, and no one does more to promote high quality history writing by amateur and professional historians who blog than HNN and its Cliopatrians. Best Post: Tenured Radical: "What Would Natalie Zemon Davis Do?" Congratulations to all the awardees and to those who make the History blogosphere such a lively and engaging place! "Weep America, For Thou Hast Lost One of Thy Most Virtuous and Bravest Sons"
The death of General Richard Montgomery at Quebec made him one of the American Revolution's most celebrated martyrs. He was one of the highest ranking officers killed on the patriot side, and came to represent the sacrifice which was required of those who remained in the struggle so that he and others should not have died in vain. A memorial to Montgomery was authorized by Congress just a few months after his death and was erected in New York in 1789. He was compared to the classic heroes of antiquity, and to his predecessor Wolfe who died in the previous war at Quebec. The Death of Montgomery was one of the first revolutionary topics undertaken by artist John Trumbull as a grand heroic painting. Those who fought in Quebec were associated with their fallen general in the eyes of the public and in their later stories about the campaign, even if they were Arnold's men and not with his attacking column. After Arnold's treachery, it was better to remember service under the martyr than the traitor. This can lead to confusion in the historic record, such as the claim mentioned in previous posts that a cannon that now resides in Elizabeth New Jersey is the very same weapon that killed Montgomery and wounded two native sons: Matthias Ogden and William Crane. The problem with this story is that Ogden received his wound alongside Benedict Arnold at the other side of the lower town of Quebec, and William Crane may not have been in Quebec at all. Lieutenant William Crane did join Montgomery on his Canada expedition, some secondary sources say with an artillery unit. The only record of a Lieutenant William Crane in the Historical Register of Officers in the Continental Army is of a man who enlisted in the 4th New York continentals in July 1775 and was wounded 2nd November by a shell at St. John's, Quebec. His subsequent record in Spenser's (additional) New Jersey Continental regiment and other biographical information strongly suggest that this William Crane and the one from Elizabethtown are one in the same. The cannon was one of fifteen captured at Stony Point by Americans under General Anthony Wayne. It was traced back to Quebec, but how it was determined that it was one of the four in the battery that confronted Montgomery's column and the very one that killed the general is nowhere made clear. Veracity made no matter; the citizens of Elizabethtown were proud to have such a relic and all the better to associate it with two such prominent local citizens who had been wounded in Canada. Aaron Burr should have come out of the campaign with burnished laurels, and indeed his Princeton classmate Hugh Henry Brackenridge gave him a prominent part in his epic 1777 drama "The Death of General Montgomery at the Siege of Quebec." Burr was ambitious but found the self promotion and ingratiating required for advancement repugnant. Matthias Ogden did not find this so difficult, requesting permission to carry one of Arnold's dispatches to Congress in Late January 1775 and receiving a Lt. Colonelcy soon thereafter in the 1st New Jersey Continentals. With his help he secured Burr an appointment on Washington's staff but it was not a good fit and he soon was assigned to General Putnam. Burr's military career ended because of ill health in 1779, while Ogden served through Yorktown, was made a Brigadier General, and at his request was sent to France where he met with Benjamin Franklin and was presented at court. Ogden returned to America with news of the peace treaty in 1783. It is perhaps for this reason that he, and not Burr, appears in Trumbull's painting holding the dying Montgomery. Most of those pictured with Montgomery were actually fighting elsewhere in the lower town with Arnold. Trumbull shared his painting with Franklin in Paris in 1785, and perhaps it was here that he determined to include the young Ogden who had so recently made such an impression at court. Franklin certainly made suggestions on other fitting subjects for Trumbull to paint in his revolutionary series. Burr had no such champion. In the end, the memory of the Quebec campaign became more associated with the sacrifice of Montgomery than the achievements of the traitor Arnold. Matthias Ogden died far too young at the age of 36, maintaining a lifelong friendship with Burr. His younger brother Aaron Ogden helped an aged and discredited Burr get his veteran's pension in the 1830s, and Burr used his influence to keep Aaron Ogden out of debtors prison by getting the New York Legislature to pass a law exempting revolutionary veterans from incarceration for insolvency. Despite what history made of them, Burr and the Ogdens were as close as brothers and loyal to each other. 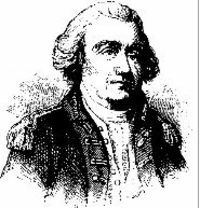 Matthias Ogden was a Captain on the staff of Benedict Arnold when the Americans assaulted Quebec City on December 31, 1775. He served as Arnold's Brigade Major, the equivalent of chief of staff, with responsibilities that included being the main administrative link between the units of Arnold's command. In a larger brigade he would has assisted an Adjutant General, but in Arnold's battalion-sized force he reported directly to the Colonel commanding. His place would have been alongside Arnold during an engagement, and Arnold invariably lead from the front. 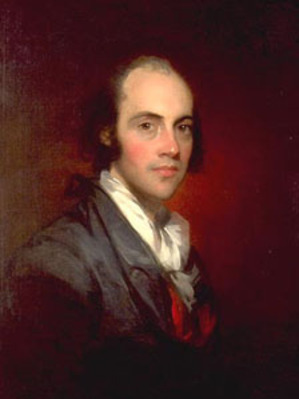 Aaron Burr had been a volunteer in Arnold's column on its march through the wilderness to Quebec, but was offered a place as an aide to Brigadier General Richard Montgomery, who had lead another force down the Champlain Valley to capture Montreal and subsequently assumed overall command of the besiegers of Quebec. In his memoirs, Burr describes the initial plan of attack which was agreed to at a council of war called by Montgomery at which both he and Matthias Ogden were present. 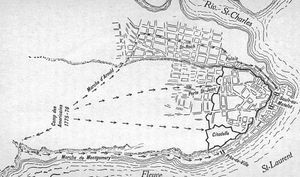 It called for simultaneous attacks on the upper and lower town of Quebec City, and Burr records that he requested and was granted the honor of leading the 'forlorn hope' that would assault the highest walls of the bastion at Cape Diamond. 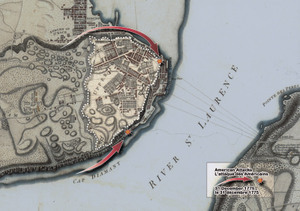 When the plan was changed to make a feint against the upper city and assault the lower in two divided columns, Burr says he had strong misgivings and was unable to dissuade the commanding general from leading the advance on the narrow beach under Cape Diamond. 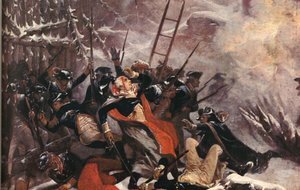 Although there is some confusion as to his actions during the attack, most of the evidence suggests that in a blinding snowstorm, Burr accompanied Montgomery at the head of the column during the night attack of December 31, 1775. "The first barrier to be surmounted was at the Pot-Ash. In front of it was a block-house and picket, in charge of some Canadians, who, after making a single fire, fled in confusion. On advancing to force the barrier, an accidental discharge of a piece of artillery from the British battery, when the American front was in forty paces of it, killed General Montgomery, Captain McPherson, one of his aids, Captain Cheeseman, and every other person in front, except Captain Burr and a French guide. General Montgomery was within a few feet of Captain Burr; and Colonel Trumbull, in a superb painting recently executed by him, descriptive of the assault upon Quebec, has drawn the general falling in the arms of his surviving aid-de-camp. Lieutenant Col. Campbell, being the senior officer on the ground, assumed the command, and ordered a retreat." Burr's version of the events has the advantage of coming from an eye-witness, in fact from the only eye-witness aside from a French guide who was with the general when he fell. There are problems with his account, however. Trumbull's painting was executed just a decade after the attack on Quebec, and the artist himself identified the portraits of the individuals he included. Trumbull painted not Burr but Matthias Ogden in the role of faithful retainer, holding his dying general in his arms. This is not fair to Burr, who was there while Ogden was not, and he seems to be trying to set the record straight in his memoirs with a bit of artistic if not historical revisionism . Ogden was with Arnold at the other end of the lower town in an advanced guard of men who lead the assaulting column. He was wounded in the shoulder during the battle, but it has taken some sleuthing to determine approximately how and when. 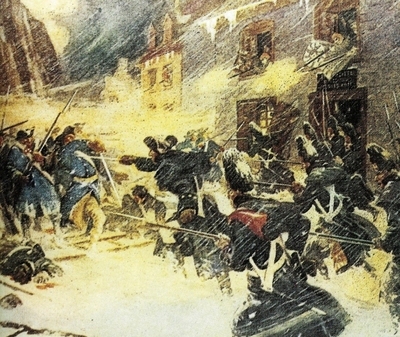 During the first rush against the barricades by Arnold's 'forlorn hope', Col. Arnold was struck in the leg by a ricocheting bullet and was helped to the rear by two men. Rifleman John Henry wrote 35 years later that he "saw Colonel Arnold returning, wounded in the leg, and supported by two gentlemen; a parson Spring was one, and in my belief, a Mr. Ogden was the other." Dr. Senter, the expedition's surgeon, recorded in his journal that he extracted the broken musket ball from Arnold's leg and "Before the Colonel was done with, Major Ogden came in wounded through the shoulder, which proved only a flesh wound." From this it seems clear that Ogden was hit during the first assault on the barricade and either helped Arnold to the rear or followed him there soon after. It was his fortune to be able to do so, as those who continued on into the lower town were surrounded and either killed or captured by morning. Arnold wrote his first account of the battle to General Wooster in Montreal even before the fight was over. He says; "The loss of my detachment, before I left it, was about two hundred killed and wounded. Among the latter is Major Ogden, who, with Captain Oswald, Captain Burr, and the other volunteers, behaved extremely well. Roberts, K (1938): March to Quebec; Journals of the Members of Arnold's Expedition: pg. 103" Nevertheless it was Ogden who ended up in Trumbull's painting instead of Burr who was there. It was Ogden who the citizens of his hometown Elizabethtown, New Jersey claimed was wounded by the cannon that now stands in front of the Union courthouse and supposedly is the very one that killed Montgomery at Quebec and wounded another Elizabethan, William Crane. We will examine the reasons for these false memories in a concluding post. Aaron Burr was just 20 years old when he and his childhood friend and university classmate Matthias Ogden traveled from New Jersey to Cambridge seeking commissions in the American forces under General Washington. Though they initially were unsuccessful, they soon learned of Col. Benedict Arnold's planned march through the wilderness of Maine into Canada and joined the expedition as volunteers with the honorary ranks of Captain. Matthias Ogden wrote in his journal of the suffering endured by the survivors of the expedition. "(N)ever were men more fatigued, at any time, nor ever could men bear up under it better than they. Surely no person, unless he was present, could form any idea of the hardships surmounted." "After traveling a short distance we came on Capt. Goodrich's track, which soon led us to where he encamped the evening before. We here found a part of two quarters of dog they had killed and hung up for the remainder of his company that was behind; the other they had eaten and taken with them. One of our Company, rejoiced to find the prize, immediately cut a part of it, roasted it on the coals and ate it very greedily. About an hour after we fell in with the rest of the Company which had passed another way. We found them much dejected and spent with fatigue and hunger. We informed them of the meat, at which they sent two men for it immediately. We then traveled on in a very bad road, sometimes over shoes in mire, sometimes climbing on all fours, and at others scarcely able to see for the thickness of the bramble and small fir shrubs. At 3 o'clock we hailed Capt Derbon [Dearborn, whose Newfoundland Dog had been killed for food: Ed] and one more going down stream in a birch canoe. They informed us that Capt. Morgan had his boat split upon a rock, the most of his effects lost, and one man drowned; that he saw where Col. Arnold's boat was stove; what his loss was he knew not. After traveling about 20 miles with our packs on our backs, we encamped by sunset much fatigued and very hungry." The fact that they survived the ordeal (Burr nearly drowned) is testament to young Ogden and Burr's stamina and spirit. They were well matched in this regard, though very different physically and perhaps also in temperament. Matthias Ogden has been described as "a swashbuckling youth of enormous strength who loved a good joke" by Theodore Thayer, writing in As We Were - The Story of Old Elizabethtown, though Thayer also notes he was "occasionally slowed down by attacked of asthma." Aaron Burr was very small but fearless, and both is courage and Ogden's were noted by their contemporaries. Unlike Ogden, however, Burr was less adept at maintaining good relations with his superior officers, and later in his military career even managed to estrange himself from Washington, on whose staff he had been appointed. Soon after the expedition arrived at Quebec, Burr was dispatched by Arnold to General Richard Montgomery in Montreal, and subsequently accepted an appointment on the General's staff. In his memoirs, prepared my Matthew L. Davis and published in 1836, an aged and now notorious Burr claimed that he was sent to Montgomery with a verbal message "on the arrival of Arnold's detachment at Chaudiere Pond" and that he had to sneak through the British lines disguised as a catholic priest. This does not exactly square with Arnold's own correspondence, which included a letter of introduction to Montgomery dated Nov 30th, nearly a month after Arnold reached the pond. "On this occasion, the General [Montgomery] was accompanied by Aaron Burr, whom he had appointed his aid. This was the first time that lamb had ever seen him; and as his appearance was juvenile in the extreme, he wondered that the General should encumber his family, with the addition of one, who seemed a mere boy. But upon a more thorough scrutiny of his countenance, the fire in his eye, and his perfect coolness and immobility, under such dangerous fire, convinced him that the young volunteer was no ordinary man; and not out of place in the most important position." Given than only one of the first hand accounts of Arnold's expedition makes mention of Burr - that of rifleman John Henry dictating his deathbed memoirs more than 35 years after the fact - it may be that General Lamb embellished an old memory with the gloss of later celebrity. "Should fortune ever frown on you, Matt; should those who you now call friends forsake you; should the clouds gather force on every side, and threaten to burst upon you, think then upon the man who never betrayed you; rely on the sincerity you never found to fail; and if my heart, my life or my fortune can assist you, it is yours." They would be in the thick of the fight at Quebec, though not together. One would be memorialized in a famous painting, the other left to make his case in his memoirs. We will examine the parts that each played in the battle, and discuss who was portrayed in Trumbull's famous painting The Death of Montgomery, in a future post. Where's Aaron? Curious Omissions and Inclusions in Trumbull's "Death of Montgomery"
John Trumbull painted "The Death of Montgomery" while he studying in London under Benjamin West, arriving before hostilities between Great Britain and her Rebellious Colonies were concluded. I have found various references on-line that place its creation between 1784-1786. Trumbull aspired to be the definitive artist of the Revolution, and among his contemporaries there is none with a greater claim to that distinction. He meticulously included portraits not only of Patriot luminaries and the high command but of many other participants in the historical events he set to canvas. There are no fewer than eleven historic personages identified with his masterful painting "The Death of General Montgomery", including my collateral ancestor Matthias Ogden. I do not know on what authority (aside from its impeccable credentials) The Smithsonian Institution identified the individuals named at left with the figures in the painting, and I would dearly love to know who the unidentified continental officer standing at right might be. I created the captions for the paintings using the Smithonian IDs as a guide, but in some cases cannot say whether a named group should be identified from left to right or in some other order. In any case, it serves our purposes to know that these named participants are depicted with Montgomery at his death, for the truth of the matter is that many of them were not, and a key individual who most certainly was appears to be missing. To begin with, the assault on Quebec during the night and early morning hours of December 30-31, 1775 consisted of a four pronged attack. Two feints were planned against the western wall and St. John Gate by Colonel Livingston's Canadian volunteers and Major Brown with part of a regiment from Boston. Col. Benedict Arnold and the veterans of his overland march to Quebec from Maine, along with Capt. Lamb's artillery company and a single six pounder, would skirt the northern walls and attack the lower town from the East, while Brig. General Montgomery and his New York troops would make their way in another column by Cape Diamond and attack from the east. The plan was for the two pincers to meet up in the lower town and force their way into the city above. Neither column came close to the other and the battle ended in disaster for the Americans with Montgomery slain, Arnold injured, and all but a few hundred of the Americans killed, wounded or taken prisoner. The men included in the painting above are an amalgam of both columns. Maj. Return Meigs and Brigade-Major Matthias Ogden were field and staff officers under Arnold and part of his assaulting column, not Montgomery's. Captain Hendricks lead a company of Pennsylvania Riflemen and Lieutenant Humphries was in another from Virginia. Both were killed in the battle, and both were likewise in Arnold's column in the Division lead by Daniel Morgan. 19-year old Captain Samuel Ward, son of the Governor of Rhode Island, lead a company in Lt. Col. Greene's division under Arnold and was also captured. None of them was present when Montgomery was killed, but it served the artist and the nation to remember them this way, for Arnold later betrayed the Revolution while Montgomery was a martyr and a fitting symbol for all they sacrificed. We will return to this idea later, for it is central to unraveling myth and memory. The other figures identified in the painting included Montgomery's aide-de-camp Capt. John MacPherson and another aide Captain Jacob Chessman of the 1st New York, both slain in the same cannon blast that killed the General. The figure identified by the Smithsonian as Oneida Chief Col. Joseph Lewis was actually a Caughnawaga Mohawk with a fascinating past who did indeed accompany Brigadier Montgomery's Canada expedition as a messenger. Lt. Col. Duncan Campbell, the senior officer with Montgomery when he fell, is criticized for not pressing forward after Montgomery was killed and ordering such a hasty retreat that the General's body and those of his fallen aides had to be abandoned. The aide who belongs in the painting, in fact who should occupy the position of honor ascribed to my ancestor Matthias Ogden, holding his dying commander in his arms, was captain Aaron Burr. We shall pick up his story on that fateful morning in a subsequent post. In 1786, American artist Jonathan Trumbull painted "The Death of General Montgomery in Attack on Quebec, December 31 1775". The original is now in the Yale Art Gallery). The artist, himself a war veteran, was at the height of his creative powers when he painted this work. It is dense with allegory and references to other famous paintings. The spirit of the new American republicanism - a central theme in Trumbull's art - is evident in the composition of the figures and the diversity they represent. There are back-country riflemen striking classical poses of allegiance and vengeance, gentlemen volunteers in captured British greatcoats, and even an Oneida chieftain rallying to the defense of the fallen General. It is a fascinating and powerful image. 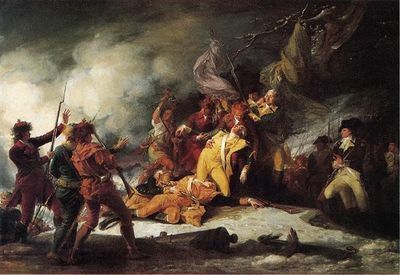 But except for the fact that Montgomery and two of his aides were slain at Quebec in a single blast of cannister, and despite including the portraits of actual participants in the battle, Trumbull's painting has more to say about how the Revolutionary generation wished to remember history than the actual events themselves. The painting is notable both for what it omits as well as its inaccurate inclusions. My interest "The Death of General Montgomery" began, as so many of my historical inquiries do, with a matter of family history. According to a description of the painting in the Smithsonian American Art Museum's Inventories of American Painting and Sculpture database, the officer holding the dying General in his arms is my collateral ancestor, Matthias Ogden. Matthias Ogden served as Brigade Major in the forces at Quebec under Colonel Benedict Arnold, having survived Arnold's epic march that fall through the backwoods of Maine and over the Height of Land into Canada. In his hometown of Elizabeth New Jersey, there is an old cannon outside the Union County Courthouse and a plaque which proudly claims that this was the very weapon that laid Montgomery low and wounded Matthias Ogden and another fellow townsman - William Crane - at Quebec. I've seen the cannon, and many writers have accepted its history at face value, but like Trumbull's painting it offers a past for Matthias Ogden that cannot be. 14th - "Toward evening the Colonel wrote a letter to the Commander-in-Chief in the town, demanding a surrender of the place and letting them know what they might expect should they put him to the expense of taking the town by storm. I was the person appointed for going in with the flag. According to custom I took a drummer with me, who, as soon as had risen the hill, beat a parley, and I at the same time raised my flag and marched on, waving it in the air, until I was within four rods of St. Johns' Gate, when I was saluted with an eighteen-pound shot from the wall. It struck very near and splattered us with the earth it threw up. I at first thought it had killed the drummer, but he had only fallen with fright. We did not wait for a second, but retreated in quick time till under cover of the hill." Arnold himself described Ogden as "a young gentleman of good and opulent family from Jersey" and commended him most favorably in dispatches. There was at least one detractor: a young Pennsylvania rifleman named John Joseph Henry, who in a deathbed memoir dictated more than 35 years after the fact, accused Ogden "most stupidly" of placing another riflemen in an exposed position where he was subsequently captured. Henry called Ogden "a large and handsome young man, in favor with Arnold." This is damning with feint faint praise indeed given Arnold's subsequent ignominy, but Kenneth Roberts notes that Ogden's placement of the sentry in a thicket would tend to make him less conspicuous to the enemy, not more so, and the unfortunate rifleman more likely was captured asleep in his post.